The night after Christmas was clear so me and my observing buddy and friend Mat went out to the West Desert here in Utah for a night of observing. I am working on the Eridanus and Fornax Galaxy Clusters right now and this one was a good place to start. I used my 27mm Panoptic as my finder and the galaxy popped right out with it. It was large, spacious and somewhat faint. I then moved to a 10mm Pentax XW and found more detail. The nucleus is stellar with a bright core region around it, surrounded by diffusion. Using averted vision popped the core. Fun object to find, observe and sketch. I used my Orion XX14i on this object, which is a 14 inch truss dob. The conditions were clear, cold, about 15 degrees and the seeing is rated at an Antoniadi II. A beautiful sketch on a cold clear night. Nicely done Jay. Very smooth and soft detail you’ve laid down. The off-set position of the galaxy in the frame is a really good touch. 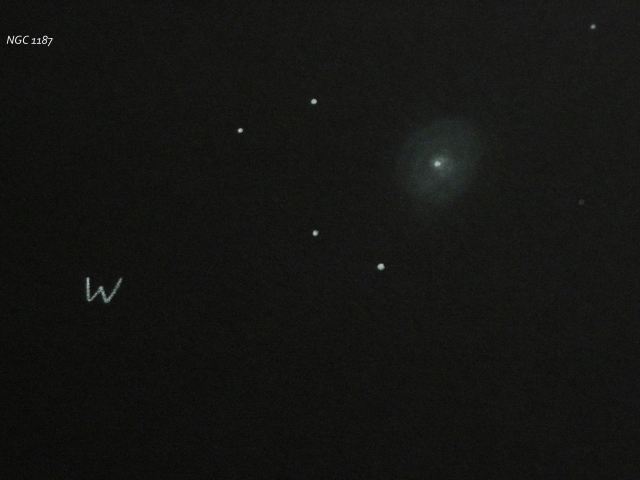 It gives your sketch movement and a sense of immediacy that the galaxy is about to drift out of the field of view.